There’s just something so cool about the design of Nixie tubes – I think it’s just that for such an old technology, they’re still sort of timeless. It’s been a little while since I saw a really good looking Nixie clock though, but this one was definitely worth the wait. 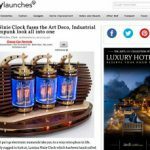 Lamina Nixie Clock fuses the Art Deco, Industrial and Steampunk look all into one. 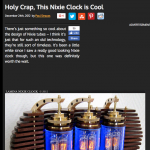 Nixie tubes that put up electronic numerals take you to a very retro place in life. While incredibly rugged to look at, Lamina Nixie Clock which has been handcrafted by artist Zoltan Acs is quite a work of art!